Are you a professional table tennis player looking for globally approved table tennis equipment? Or do you desire to become a pro at table tennis? It is recommendable to use equipment from a certified supplier of Olympic table tennis equipment. DHS table tennis is the leading supplier of Olympic equipment. The supplier stores modern equipment that meet the standards laid out by ITTF. Why Buy DHS Table Tennis Equipment? How to distinguish between genuine and fake DHS table tennis ball? Not all Table Tennis equipment is worth your money. Many online suppliers sell, store or market products not tested and proven. Here in tabletennispot.com, we review our products and ensure that you only get quality at an affordable price. In this spirit, we bring you a review of why DHS Table Tennis Equipment is worth every coin. DHS Table Tennis has been the main table supplier of the Olympic Games in 2008 and 2012. It is also the official table supplier of table tennis global championships of 2010, 2011, 3013, 2015 and 2017. It is also the official supplier of table tennis balls in 2008, 2012 and 2014 global championships. This means one thing. DHS Table Tennis is of high quality and meets international game standards. DHS (Shanghai Double Happiness) Table Tennis, a Chinese company established in 1959 has a long history of offering quality table tennis equipment. The company works closely with the Chinese National Team to come up with tables, blades, and other tools that meet the needs of modern TT players. Their products are tailored to meet the needs of the team. At least 90% of the players in the Chinese team use equipment from DHS. Also, international table tennis stars such as Li Xiaoxia, Zhang Jike, and Ding Ning, use DHS equipment. It is a brand of global champions. Instead of saying DHS is a sports brand, I think it is more appropriate to say that it is a table tennis brand. Let us first take a look at the DHS in the field of table tennis to know at which level the company is. In order to figure out this, I went to find a professional table tennis player and asked her how much she knows about DHS. She told me very seriously that DHS is the best performance table tennis brand in China for the rackets. Take the finished rackets as an example, the rackets are divided into 1 star to 6 stars according to the star rating of DHS standard. My friend recommended her 5-star racket, although there is nothing particularly prominent. But the five-layer pure wood blade, match with DHS Hurricane 3 rubber, make the racket balanced in all aspects which is good enough for a starter to use for a long time. For relatively advanced players who know their own playing style, they will choose from different blades, forehand rubber, and backhand rubber according to their own playing styles. DHS does have some blades that are in the high-end product lines. But the names of these blades are a bit chic. The blade that produced from the cooperation with Wang Hao is called Hurricane Wang Hao, and Wang Liqin is called DHS Wang Liqin, and the blade that cooperated with Ma Long is called DHS Ma Long. As far as the products of the table tennis series are concerned, DHS is indeed one of the best table tennis brands in China. After all, the company began to produce rackets in 1959, coupled with the “Ping Pong Diplomacy” policy of the time, everyone is shouting with the slogan “use the small ball to spin the big ball”. Because of this, all the people in China began to play table tennis. For a company that entering the professional field earlier, they have accumulated a large sports mass base. Coupled with government support, it is definitely a virtuous circle of business. So, it is not surprising that DHS can be the most famous brand in the country in the table tennis arena. DHS is a brand relished by most table tennis players, it is also a brand that is trusted by many people. But there are plenty of fake DHS table tennis balls available on the market, so how can you distinguish the real and fake one among them? Well, I would show you some ways that you can use to distinguish between a genuine and fake DHS table tennis ball. For the packing, the security strips of the genuine goods are clear and evenly arranged (can be seen in the fluorescent light or facing the outdoor light), and it has 6 to 8 stripes. The anti-counterfeit strips of counterfeit goods only have 2 to 3 stripes and the stripes are relatively thick. For genuine DHS, the fonts are protruding; while fake one the fonts are flat. The authentic DHS table tennis ball is clearly printed. For 3-star balls, they are printed in two colors. The fonts are arranged neatly and the characters are evenly spaced. The orange ball is printed in blue and black. Look at the purity and uniformity of the ball color. With multi-ball contrast, authentic DHS balls have higher purity and better uniformity. See the uniformity of the ball joints. Get the ball and facing to the light, and the seam of the ball can be observed through the light. 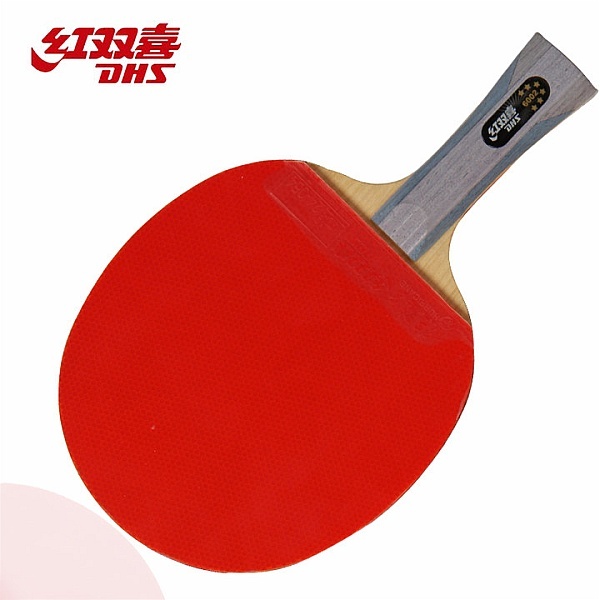 The authentic double happiness table tennis seam is neat and uniform in thickness. The production date on the DHS 3-star balls package is printed with special code using digital printing technology. I believe by referring to the above five points, everyone will be able to buy the genuine DHS table tennis balls. The company’s equipment is sold online. You can purchase directly from this website. It guarantees you of quality, affordable and high-tech DHS products that do not disappoint. DHS table tennis equipment stands out from the crowd and their names start with DHS. However, it is important to be careful not to land on counterfeit products purporting to come from DHS out there. Always buy from trusted online sellers like Amazon or megaspin.net. DHS Table Tennis Equipment is tested and proven. It is for those who need to excel in table tennis game as a career. Do not be left behind! Try DHS tables, balls, rubbers, bats, blades, and accessories.